This photo first surfaced in late 2006 on Paul McCartney's concert DVD The Space Within Us. It can be presumed the photo is from Paul's personal archive with a good possibility that it was taken by his brother Mike. However, the DVD provided no definitive date or info. Thus, for researchers, the precise dating of this photo is very vague. George joined in Feb. 1958 and, according to Andy Babiuk (Beatles Gear), George had the President before joining The Quarry Men. 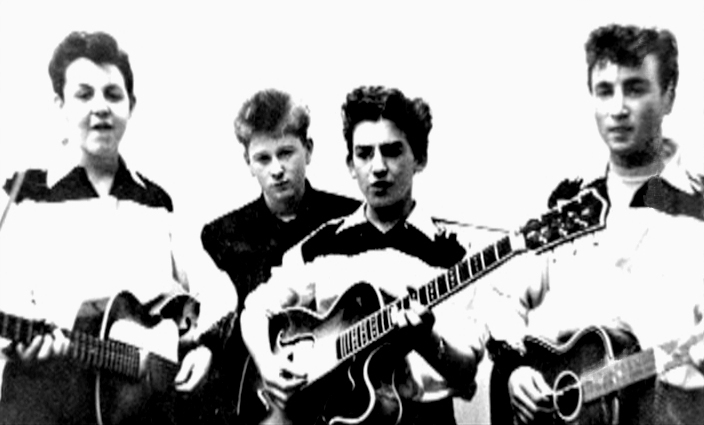 John purchased a Hofner Club 40 in August 1959. The photo HAS to date between that time. At some point 1958-59, John no longer had his Galloton and performed for some time without a guitar. In the photo from 20 December 1958 at George's brother's wedding, John is seen without his Galloton. However, I almost have to think that doesn't indicate that he didn't have it. I can't see John going from Dec 1958 to August 1959 without some sort of guitar. I have found no specific dates but I would suspect he had the guitar well into 1959. In Hunter Davies' The Beatles Authorized Biography (page 63), in the chapter "From Quarrymen To Moondogs", Davies writes, "For their public performances, they were usually all dressed like Teddy-boy cowboys, with black-and-white cowboy shirts with white tassels from the top pockets and bootlace ties." However, there is no clear date indication other than it was after George joined. In the surrounding text, Duff Lowe is mentioned as well as the band entering in skiffle competitions and that John was still at art college. So, we're still at 1958-59 in general. Still nothing to narrow that date down. Men member, the late Eric Griffiths and, indeed, he does look similar to Eric. appears as though he severed contact as well. "Several people have already emailed me and asked me if I know who this is. I'm afraid I have no idea who it is. I'm sure it's not Eric, I knew him pretty well and this guy's ears are the wrong shape for Eric's for a start. Regarding the cowboy shirts, you could be right, but it was after my time so I can't offer an authoritative opinion." seen in the photo with George on this page. expert/collector, Larry Wassgren, offered the following info and theories. "John says he bought a beat-up old Spanish model but it was actually new when he bought it. Maybe he's remembering beating it up and trashing it!? If he had been looking at the Gallotone in Mendips wouldn't he remember it was a Gallotone? Because he can only remember it was 'guaranteed not to split' tells me the guitar had been gone since more than likely 1958." "If he replaced it with a Martin Colletti that guitar would be a little better quality than the Gallotone but not much. I believe Paul's second guitar was a Martin Colletti and it's likely John gave/sold Paul that guitar after he 'relieved' somebody of their Dallas Tuxedo in Manchester at the Carol Levy's Competition. The Dallas guitar is real as I was there when Ernie Burkey tried to give it to me in Lennon's bedroom. He was using that room for storage and put the Tuxedo guitar there after workers found it and the banjo magazines in the loft. This was in 1996 and there was 35 years worth of grime on that guitar! Lennon couldn't take this guitar out and pestered Mimi until she finally gave in and put a down payment on his Hofner Club 40 at Hessy's. That's the way I see it, can anybody prove me wrong?" 'We were at Garston market one day when my mother was drawn to one such rowdy auction. They were selling 'the best geniune cowboy shirts outside America'. We stopped and edged our way into the crowd. Mistake. Unless my mother meant it. The runner was there in a trice with several folded coloured check shirts. The game was on. I stood and gaped as Mummy bought not one, not two, but three of these shirts. You can see the boys wearing them in both the Rosebury Street and the Woolton fete photographs. Quarry Men cowboys. John loved those shirts'. "She was remembering wrong. The checked shirt was worn at the fete and Rosebury Street. Now with this new photo surfacing I would imagine she'd rewrite that. 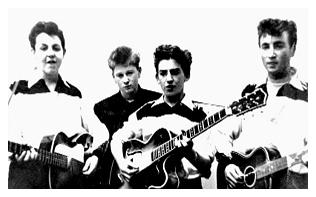 I did e-mail her the link to this new Quarrymen photo as I knew she'd love to see those shirts!"